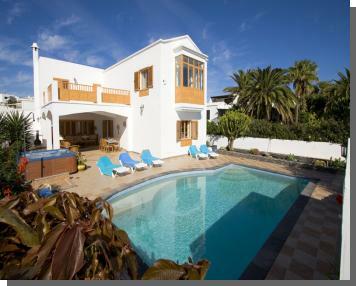 Villa Mariana is a modern and spacious four bedroom villa situated in the Central Avenida area of the Puerto del Carmen resort. It is therefore only 2 minutes walking to the nearest shops and the beach is only a 7 minute walk. The villa enjoys spectacular sea views and is surrounded by extensive mature gardens. The owners have installed broadband internet access for guests to use. There is also an alarm system and a safe. Outside the villa there is a heated swimming pool, which has a built-in spa bath and jacuzzi, as well as night illumination. There are plenty of sun loungers around the pool, as well as a covered terrace with a barbeque for alfresco dining. The villa also has off street parking.